The Blanding’s turtle, also known as “semi-box turtle,” is a beautiful semi-aquatic turtle. They are considered a medium-sized turtle with a maximum length of around 10 inches. The unique feature that distinguishes them from other species is the prominent yellow neck and chin. Their upper shell is usually dark, with tiny yellow spots all over it. One thing that is very intriguing about these turtles is the fact that they show no signs of aging, and can live up to a hundred years in some cases. This is why they are considered a highly non-senescent species. Their scientific name is Emydoidea blandingii. They come from the Emydidae family, and their order is testudines. They are native to Canada but can also be found in certain areas of Mexico and the United States. In the US, they are found in many of the great lakes of Dakota and Maine, as well as New York & Minnesota. Their populations throughout the region are very inconsistent, and therefore cannot be specified as high or low. The turtle was named in honor of Dr. W Blanding. A fun fact is that the shape of their mouth makes it look like they are smiling. Despite looking cheerful, they can be quite shy and frightened. Their shell is often referred to as an army helmet because of its domed shape. Blanding’s turtles are omnivorous species, which means they eat both meat and plants. In the wild, they are capable of catching live fish. Other than that, they also like eating frogs and berries. They are generally said to eat balanced between carnivorous and herbivorous diets. They eat insects such as dragonfly, lizards, and beetles too. Crayfish are one of their most preferred prey. As they grow up, their preference shifts towards the carnivorous diet such as fish. In captivity, Blanding’s turtle is a very demanding specie when it comes to the living environment and diet. It is recommended that people with experience keep them only. They can be fed dried shrimp, tuna, dry nutritional turtle pellets, and fruits as well. The thing to keep in consideration is that each turtle will have its own preferences with food, and it is up to the owner to observe and find out what they are. Another thing to keep in mind is to not feed the same thing to your Blanding’s turtle twice in a row. Their babies are fond of overeating due to their fast growth and should be monitored. They are usually found in great lakes, and shores. They prefer clean water and not a lot of depth. Due to their small size, they like shores they can easily get onto. They are often found hiding on wet logs, sometimes floating on water. Their shell also provides them camouflage on mossy boulders. Since they are semi-aquatic, they prefer areas with plenty of vegetation. To avoid water-based predators, they stay in temporary wet areas. During their overwinter periods, they are found as deep as 2 feet under wet soil and a meter deep in shallow lakes. In captivity, they should be provided wet soil in the backyard for that purpose or a secluded environment indoors. It should also be ensured that their living space is not too cold. What Predators Does Blanding’s Turtle Have? 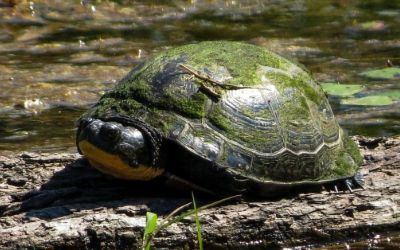 Foxes, raccoons, skunks, coyotes, and snakes have been known to eat Blanding’s turtle eggs, therefore being the biggest threat to their existence. Since they are slow breeders, they take as long as 20 years to start breeding and most of their eggs do not survive in the wild. This is one of the reasons why the specie is not considered endangered. Foxes and raccoons also prey on baby turtles. Adults, on the other hand, develop a very hard shell that protects them from almost all predators. 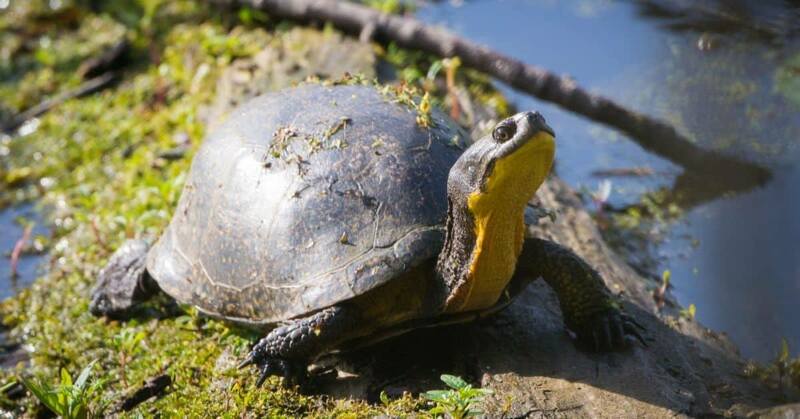 Since 2008, the Blanding’s turtle has been considered threatened in Canada. It is considered endangered by IUCN. Their estimated population is less than 100,000. Efforts are constantly being made in areas like Nova Scotia to bring that number up. Blanding’s turtles take between 15 to 20 years before they are mature enough to start reproducing. Females can even take 25 years to reach maturity. They generally lay eggs in soil that receives plenty of sunlight. A clutch ranges between 17-15 eggs, and they lay clutches after every gap of 24-30 months. In colder temperatures, the hatchlings are mostly males and vice versa. In the wild, most eggs get eaten by predators, and not many babies live long either. If they reach maturity, then they live very long lives due to their very strong shells and non-aging capabilities. The Blanding’s turtle is a very complex specie. They are not easy to keep as pets either. They are very demanding concerning diet and habitat. They also have very inconsistent natures and therefore hard to determine what they want. They are also very moody. They are a fantastic animal, but not recommended as a pet for everyone. If you have any more questions regarding Blanding’s turtles, feel free to ask us in the comments. What do you think of this beautiful species? If you are a turtle or tortoise owner, please share with us in the comment section as well.